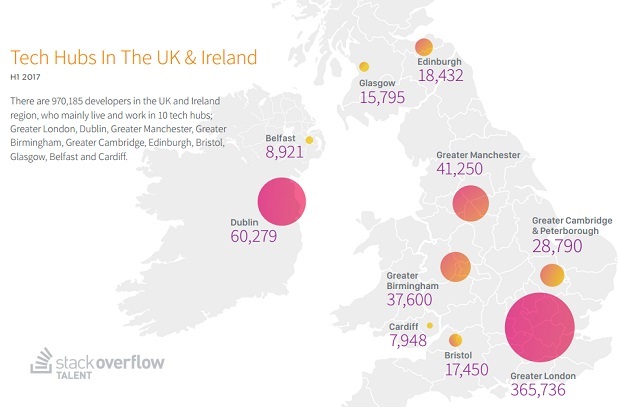 Dublin’s developers make up nearly 10% of the city’s working population, the highest proportion of all cities in the UK and Ireland, according to new data from Stack Overflow’s Q1 Developer Ecosystem Report. London still maintains the largest tech community – with over 365,736 developers calling the capital home – however, they account for a smaller section of the city’s workforce, at approximately 7.7%. 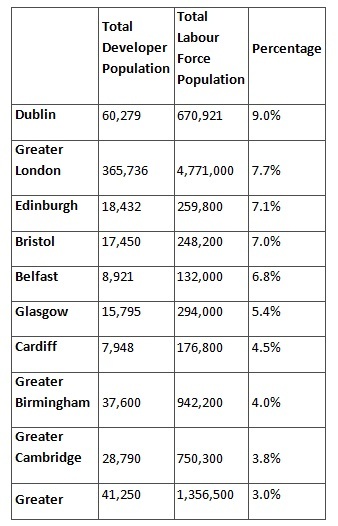 Meanwhile Edinburgh comes in third place, with developers making up 7.1% of the workforce. Surprisingly, despite its reputation as a major tech hub, Cambridge only scraped into the top ten taking ninth position, with developers forming 3.8% of the city’s working population. The report also exposes the most commonly used technologies in each tech hub. Across the region Python, .Net and Java are used by the largest number of developers. Some regional differences are also exposed: for example, the Bristol and the Greater Cambridge areas are also home to large communities of developers proficient in Node.Js., while in Birmingham and the Greater Manchester area, there is a large population of PHP specialists. The data provides an unrivalled view of the availability of tech talent across the region, enabling employers to make data-based decisions on where to base their technology teams. Throughout 2017, Stack Overflow will release four new reports that take a close look at the developer ecosystem in the UK and Ireland. Each will explore a distinct theme within the tech community: the first focuses on tech hiring – how software engineers find jobs, what matters to them when considering a new position, and the tips they want to give to recruiters who are hiring their future colleagues. The reports are created using a combination of proprietary data (captured from Stack Overflow’s unique machine learning platform, that tracks IP address and user behaviour over time) and qualitative data from Stack Overflow’s annual user survey (the world’s largest developer study). The Developer Ecosystem: Tech Hiring Edition also features commentary by Code First:Girls, TransferWise, ThoughtWorks and Ovo Energy.